New Product Pricing! We have reduced our prices on smalti and stone to reflect a cheaper Euro. 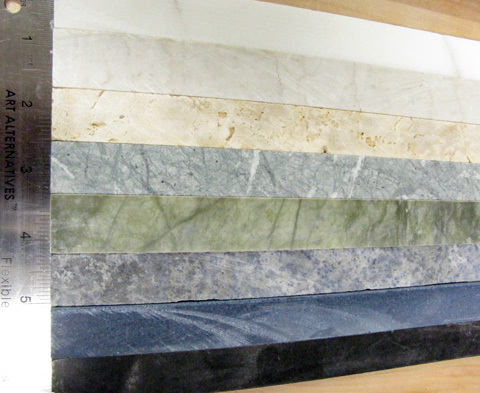 Most of our stone colors have been priced at $5.49 per half pound. This new pricing reduces the price to $5.02 per half pound. This discount is applied automatically. If you have a coupon discount you can also use this during checkout for further savings. Stone tiles are about 3/4" long x 3/8" wide x 3/8" thick. There is some variation in the size, especially length, but the size is fairly consistent within a color. To buy a sample board, click here. Please note - some of our stone has mesh applied to one side. Depending upon your application, you may need to remove this mesh. If you have questions, please ask! To zoom in or out and see more or less of the palette, hold down the Ctrl key and press the '+' or '-' key. Questions about stone? Click here. We carry a number of color in rod cut Click here for more information and available colors. How big are the stone tiles? How do I cut the stone tiles to the size I need? How many stone tiles will I need? Where can stone tiles be used? Will I need to seal a stone mosaic? Will I need to grout a mosaic made with stone tiles? Will I need to polish a stone mosaic? How do I polish a stone mosaic? The stone tiles are usually about 3/4" long x 3/8" wide x 3/8" thick. The lengths vary from 1/2" to 1", but the size is fairly consistent within a color. The two primary methods for cutting stone tiles are (a) nippers and (b) hammer and hardie. The nippers are easy to master, but the harder stones can be difficult to cut because the cut depends on the arm strength of the user. The traditional cutting tool is the hammer and hardie. The hardie, which is a chisel-like tool, is mounted in a substantial wood block. The tile to be cut is placed on the hardie and then tapped with the hammer. Mastering this technique requires some practice, but overall the hammer and hardie is much easier on the arms than the nippers, especially if cutting large quantities. For large-scale production work, a chopping machine is recommended. A half-pound of stone tiles contains 40-50 pieces, depending on the density of the stone. This amount will cover about 12 square inches. The general rule of thumb is to allow 5.5 to 6 pounds of stone per square foot. To use the stone with tiles of a different thickness or to increase the coverage per pound, you can cut the stone across the short end to create 3/8" x 3/8" tiles of whatever thickness you choose. Cutting along the long side is also possible, but is more difficult to get cleanly riven stones. If you do attempt to cut on the long side, results will be much better if you use a hammer and hardie. The stone can be used inside or outside, on walls or floors. The decision to seal a stone mosaic depends on the desired effect and the final location of the mosaic, but many stone mosaics are sealed in some way to prevent staining or to bring out the colors by simulating a "wet" look. Stone mosaics that will be grouted should be sealed before grouting to keep the grout from sticking to the surface or filling crevices in the stone. Sealers are available in most tile, hardware, and building supply stores. The decision to grout a stone mosaic depends on the placement of the stones, the desired effect, and the final location of the mosaic. Stone mosaics in floors are often polished to some degree to provide a smooth walking surface. A fairly smooth surface can be obtained without polishing by using the indirect method to create your mosaic. Start with coarse silicon oxide sandpaper (like 40 grit), and select finer sandpaper as the mosaic becomes smoother. Belt sanders seem to work better than orbital and disk sanders. 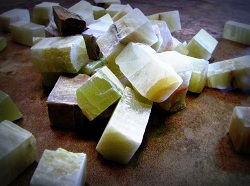 Like smalti, normal cut stones begin their life in much larger forms. They begin as large, 3/4" thick slabs. These slabs are cut down into 3/8" thick rods. All of this is done with a saw, which gives the stone 4 smooth faces. The rods are finally cut using a hand tool in to the normal cut size. This produces the two riven faces. We are able to order any of our stones in rod cut. It typically takes 7-10 business days from date of order to receive the stones from Italy. Rods are 3/4" wide and typically 6-15" in length. We do not accept orders for less than 1/2 lb. We do not charge extra for special orders.